This past weekend marked the 4th anniversary of Hurricane Katrina. Four years ago last Saturday, Katrina slammed into the Gulf Coast, causing untold property damage, environmental destruction and loss of life from Florida through Texas. At least 1,836 humans died, victims of nature, government ineptitude and indifference, and racism and classism. The number of nonhuman animal victims will never be known. Though I didn’t observe the occasion here in writing, the anniversary didn’t pass me by unnoticed. The weekend’s birthday celebrations were bittersweet; while spoiling my dog-kids with homemade treats, I couldn’t help but be reminded of the many dogs who perished in the storm and its aftermath – some of them murdered in cold blood, by people who should have been their protectors. A year after Katrina, I marked the day with a sort a photo retrospective, which I titled “The Greatness of a Nation,” after the much-loved Mahatma Gandhi quotation. Three years later, I don’t have much to add, so I invite you to go check it out if you haven’t already. The past four years have seen a number of books and films made about Hurricane Katrina; see, for example, Douglas Brinkley’s The Great Deluge: Hurricane Katrina, New Orleans, and the Mississippi Gulf Coast (2006); Jed Horne’s Breach of Faith: Hurricane Katrina and the Near Death of a Great American City (2008); and Josh Neufeld’s A.D.: New Orleans After the Deluge (2009). Many of these projects have focused on animal rescue efforts: Mike Shiley’s Dark Water Rising: Survival Stories of Hurricane Katrina Animal Rescues (2006); Best Friends’ Not Left Behind: Rescuing the Pets of New Orleans (2006); Cathy Scott’s Pawprints of Katrina: Pets Saved and Lessons Learned (2008); and even children’s books, such as Two Bobbies: A True Story of Hurricane Katrina, Friendship, and Survival (2008). 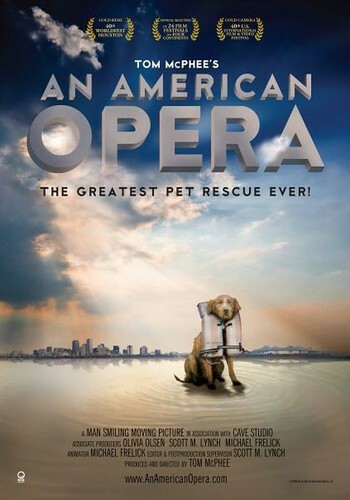 Tom McPhee’s An American Opera: The Greatest Pet Rescue Ever! is a multi-award winning documentary film chronicling what happened during Hurricane Katrina in New Orleans, Louisiana when pet owners were forced to evacuate without their pets. An American Opera follows the pets, vets, owners, officials, rescuers, and adopters of animals as they try to remedy the situation, revealing that not everyone had the same goal of saving animals. Tom McPhee directed, narrated, and produced the film with the production companies Man Smiling Moving Pictures and Cave Studio. Interviewing leaders of animal organizations and volunteers who went to New Orleans after Hurricane Katrina, it is revealed that at the beginning, everyone had different ideas about how things should be done, but no one was willing to take charge because the problem was bigger than anyone could have imagined. The film champions the volunteers whose only concern was saving animals, unlike the animal organizations who were more concerned with the chain of command. After about a month, the state put the Louisiana Society for the Prevention of Cruelty to Animals in charge who told the volunteers to stop rescuing. Anyone not with the LA/SPCA was considered ‘rogue’ and operating outside the authority. Meanwhile, the police in St. Bernard Parish were shooting dogs in what they say was a form of mercy. Months after Katrina, many owners are still not reunited with their pets because they do not know where they are and do not have the means to find them. Some people have found that their animals have been adopted out and cannot get them back. The film ends with Barkus, a Louisiana pet parade, indicating New Orleans was not washed away with the hurricane. * Jane Garrison single-handedly saved over 1,300 animals during Katrina. Jane is a long time animal activist and she founded Animal Rescue New Orleans (ARNO) as a response to Hurricane Katrina. * Susan Benezeck and Lamonte Chenevert are residents of Louisiana who were forced to evacuate without their dog. * Wayne Pacelle, Chief Executive Officer of the Humane Society of the United States, tried to balance the bureaucracy of the authorities with the animal activism of the rescuers. * Dr. Maxwell A. Lea, Jr., the State Veterinarian of the Louisiana Department of Agriculture, was a voice of authority during the crisis even though his expertise is eliminating livestock disease. * Mark Steinway, co-founder and humane investigator of Pasado Safe Haven. * Laura Maloney is the Executive Director of the LA/SPCA (Louisiana Society for the Prevention of Cruelty to Animals). A controversial figure, she is hailed as a hero by some and a hindrance to rescue operations by others. * Chris Acosta is a resident of St. Bernard Parish, Louisiana who rescued many families during Katrina, including those left behind in St. Rita’s Nursing Home. * David Leeson is a Pulitzer Prize winning staff photographer at the Dallas Morning News who got footage of the St. Bernard Parish sheriff deputies shooting dogs in the street. * Mimi Hunley is the Louisiana Assistant Attorney General with the Criminal Division who investigated the animal abuse that occurred during Katrina. An American Opera has won a slew of awards and honors; you can learn more about the film on its official website. While the movie isn’t yet available on DVD, it is hitting the road: starting this summer, the film will be screened throughout the country, in order to raise money and awareness for animal rescue organizations. A list of dates and locations is available on the Rescue Party Tour website. Current cities on the stop include Lincoln, Nebraska; Junction City, Kansas; Scranton, Pennsylvania; Oneonta, New York; Providence, Rhode Island; Boston, Massachusetts; Concord, New Hampshire; Brunswick, Maine; Indianapolis, Indiana; and my own Kansas City, Kansas, to name but a few. The tour will continue through June 2010, visiting 120+ cities, all told. Rescue groups will also be able to join the tour and set up tables with information at the screening. Filmmaker Tom McPhee will be at each screening for a meet and greet beforehand and a Q&A afterwards. Tickets cost $10 in advance and $15 at the door, with a portion of proceeds benefiting local animal rescue organizations. At $25, VIP tickets will score you a meet and greet with the filmmaker and a signed poster, with $10 will going to local rescue groups. There’s so, so much more on the Rescue Party Tour website, so do check it out. For instance, the Gimme a Shelter Film Festival offers young filmmakers an opportunity to submit shorts – 1-3 minute videos on animal/pet issues – the best of which will be screened before showings of the main feature (the cream of the crop, possibly at each subsequent stop!). Rescue groups can find out how to set up shop at a local screening, and if a screening isn’t yet scheduled for your city, the website provides contact info to help you make it happen. The Rescue Party Tour even has a dedicated Facebook group, of which yours truly is the newest member, natch! There are several movie trailers and video clips available, both on the film’s website and on that of the Rescue Party Tour. Unfortunately, embedding is not enabled, so you’ll have to hop on over there to view them. And, of course, the trailer embedded further on up in this post. Was anyone lucky enough to attend an early screening? Is anyone planning on going when the tour stops in your city? Do tell! My interest is piqued, but given the film’s subject matter, you can understand my trepidation at a public viewing – the whole affair might be too emotional to bear. (Yes, despite my bravado and potty mouth, I’m a sensitive soul, indeed.) Then again, strength in numbers. The tour doesn’t pass through Kansas City until November, though, so I’ve got plenty of time to make up my mind. This entry was posted on Friday, September 4th, 2009 at 12:16 pm. You can follow any responses to this entry through the RSS 2.0 feed. You can leave a response, or trackback from your own site. We’re to trust the organization whose primary agenda is said by themselves being to eradicate all domestic animals? I’ll pass. Pray you’renever in any disaster if you trust FEMA not to put you into an offgassing trailer that creates illness. We have an upscale travel trailer and the directions clearly reflect the dangers of off gassing. If you have a conscience have you ever thought about the Katrina survivors who were sent to all 50 states and possessions–one way and still can’t get back to New Orleans? You might love, but I find light years beyond ghoulish the organizations that made no serious efforts to find animal owners, but went straight to gonad gutting all possible animals then transported them many states away to whatever “shelter” needed animals to sell to keep open. God gave us a brain; use it to think with and quit being so easily brainwashed by propaganda.